With 50 (ish) weather, the boys and I took the opportunity to meet Mac and E for a Sunday ride out to Eclipse. 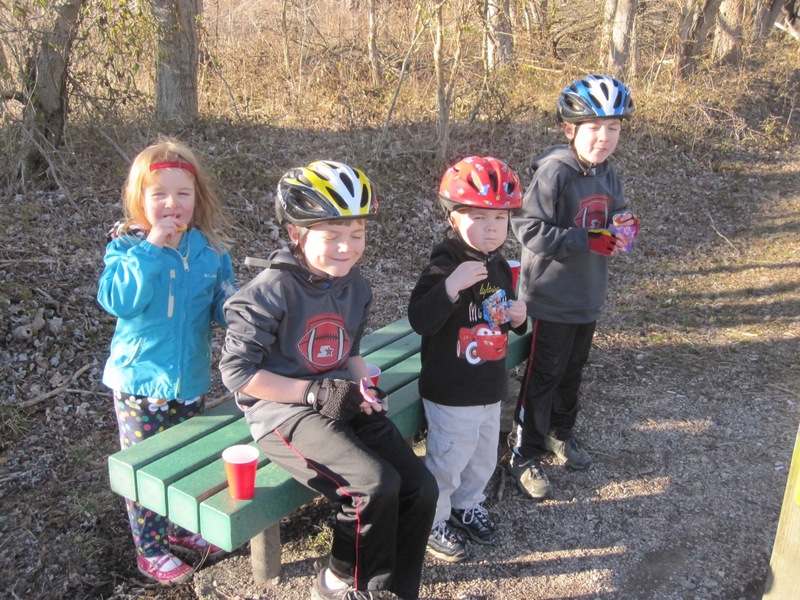 The kids had a great time, though the got a bit chilly in the shady parts of the bike path. My boys each wore long sleeve shirts and sweat shirts, and could have used full-fingered gloves. While Scalia said it was 48 degrees, Mac and I estimated an 8-10 degree drop in the shade. So next time we should bring an extra layer. Carter seemed cozy in the trailer and even managed a nap on the way back. Clay lost his chain about 3 miles from the car. I need to remember to pack a crescent wrench for his wheel, as the Crank Brothers multitool wasn’t made for servicing a fixed wheel. Fortunately I was able to massage the chain back on and we made it back to the car without any other problems. I also found I’m a bit out of practice putting together the bike train, as it took me 20 minutes to assemble the rig. It will get easier with more practice, though by summer, Cole should be riding on his own. That should shorten the rig to just a trailer. This entry was posted in family cycling by Chad. Bookmark the permalink.